Description: Crystalase Ankh Pendant Handcrafted. Strengthens immune system, sheilds ELF, stabilizes, balances chakras and auric field. * NOTE: Ankhs can be personalized with chakra gemstones attached to the ankh, for extra fees. Tested to determine your customization. Please contact us for more information. Ankh Pendant for $225.00 each. Description: Z-Ankh, Crystalase Lasered Crystal Technology Pendant. Read Testimonials about our line of Z-Ankh Pendants. 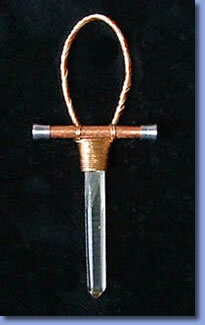 * NOTE: Z-Ankhs can be personalized with chakra gemstones attached to the ankh, for extra fees. Tested to determine your customization. Please contact us for more information.